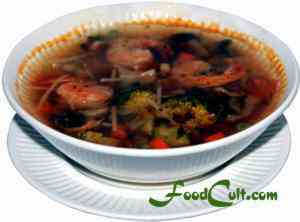 Soups &amp; Stews - Free, Easy Recipes @ FoodCult.com - A Place for Galganov's Recipes and More - Food Matters! I grew up thinking that a meal isn't a meal without soup. Today I know better. A meal can "be" a soup. We still enjoy a soup before a meal but, now, soup can also be the meal. Soups are generally quick and nutritious. A quick vegetable soup, for example, takes no more time that opening a can.